Our Mission is to help entrepreneurs and small business owners to increase the entrepreneurial projects success rate. We are an online business development program that helps companies to create a Master Plan in the top 5 business areas, Leadership, Administration, Finance, Marketing and Customer Fulfillment. Our Master Plan! Your business success! Leadership area: accomplish success as a true leader, with well defined company Mission and Objectives and highly committed and motivated employees. Administration area: Perfectly organized business, your team working like an orchestra, with accountability, commitments and timelines for everyone. Finance area: Cash-flow management, short and long term indicators to guarantee business survival and plan for significant growth, well-defined key indicators to measure your business performance daily. Marketing area: Increase sales conversion ratio, tell the entire world what makes your business unique and why should they be doing business with you. Customer Fulfillment area: Exceed your client’s expectations every time. 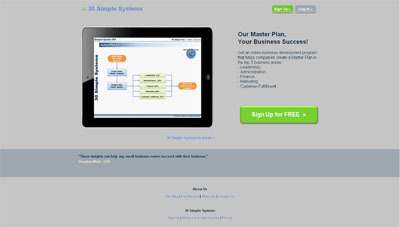 Create High Performance team and other simple business systems! A Master Plan: Develop a customized, business adapted, Operations Manual and Team Environment for systematic effort to perfect the company’s processes. Online content: Access to online files, diagrams, task-lists, videos, and others, anytime, anywhere. A Step-by-Step Program: With real-world examples, step-by-step tasks and explanations for an intuitive learning on how a business should work. A selection of Best Practices: Implement proven and tested business management best practices in Leadership, Administration, Finances, Marketing, Customer Fulfillment, etc., and ensure that the business works despite the absence of de owner’s. With Online Support: Innovative web-based solution with follow up calls and e-mails to help you stay on track and get there. clients stay on track and get there. We developed an innovative totally web-based business development program, based in a methodology with more than 20 years of experience and successful implementation as a traditional consultancy program by our Consultant Partner, Mr. Tom Bardeen, and we truly believe that our program is very Simple, Impactful and Affordable.